• Back protector constructed in three waist-to-shoulder dimensions in order to cover all the body size. • New structured back shell plate is constructed from a high performance polymeric material blend for optimized flexibility and excellent weight-saving. • Protection incorporates hybrid construction with lattice shell with a new viscoelastic PU foam compound. • Horizontal flex channeling for adaptive fit in all riding positions. • Back protector CE certified to EN 1621_2:2014 LEVEL 2. • New single-injected lattice structure shell constructed with ergonomic design to absorb high impacts and allow maximum breathability and air flow. • New soft viscoelastic PU foam compound on the central spine area for fit, comfort and impact absorption. • Convex design on the central hard shell provides highest level of protection of the spine. • New adjustable rib protector constructed from a high performance polymeric material blend for additional side protection. 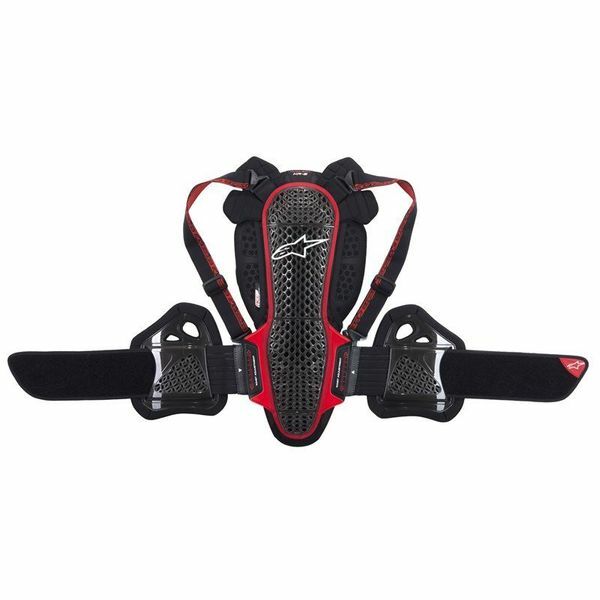 • New shoulder blade padding extensions to protect the impact areas.